Despite what the critics say, I don’t feel qualified to name (500) Days of Summer “the coolest romantic comedy of the year.” Not because the film wasn’t great – I loved it – but because I don’t watch that many romantic comedies. That may be the main reason I liked it. I’m cynical about love stories in general and fairytale endings in specific, but (500) Days “is not a love story, it’s a story about love” and that’s an idea I can get behind. Importantly, the main character of this self-proclaimed romantic comedy is not the girl, but the boy – Gordon-Levitt’s Tom. This does not mean a slip into Apatow style debauchery. Instead, the audience is taught the important lesson that sometimes it is the guy who has the crush and fairytale fantasy and the girl who doesn’t believe in love or relationships. Other than for it’s departure from the normal sexism of its type, (500) Days also deserves praise for keeping the mood upbeat. Even when our guy is so down he gets moved from Valentines to Sympathy at his greeting card job, humor is interjected to quell our rising tears. Even if we aren’t sure if Tom will end up with Summer, we know that he will be okay (eventually). Another reason to see this movie is for its unique cinematography and perfectly picked soundtrack. To match his mood Tom’s imagination takes us into splitscreens, b&w french cinema, dance sequences with animation, clips from other movies and a sketched world drained of color. The music (which is available for purchase and has a website for audio sampling) is a mashup of already available songs and the various karaoke samplings of cast members. From the requisite She & Him to Regina Spektor, The Smiths and Hall & Oates the diverse collection will stay in your head long after you leave the theater. It’s the kind of soundtrack you can easily imagine backing up your life. I understand your skepticism about romantic comedies because I myself hate 99 percent of them. But the ones that look a little different, a little odd, I give a chance to win me over. 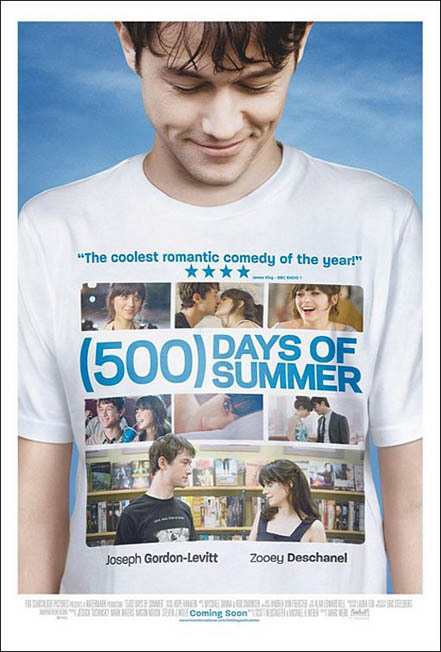 “(500) Days of Summer” certainly wasn’t a perfect film, but I really liked the relationship-in-a-blender approach as far as the storyline went, and I thought Joseph Gordon-Levitt did an excellent job. (I’m kind of over this whole “Isn’t Zooey Deschanel lovely?” thing.) But the music was excellent, and I’m pleased to see that She & Him — the she being Deschanel herself — show up on the soundtrack. I, too, wouldn’t claim the film as perfect, but I do think it has something the typical romcoms of today miss. By the way, I love your blog! Thanks for commenting. I loved the soundtrack!! I haven’t seen the movie yet though. I can’t wait to see it! !